Melt the chocolate with the butter and reserve. Place a pan with a small amount of water inside over the stove burner, and bring the water almost to a boil. Place a large bowl over the simmering water, and add to it the sugar and the eggs (still cold from the fridge). Beat them together with a whisk or an electric beater, just until the mixture is at room temperature. Pour the chocolate mixture into the egg/sugar, whisk to incorporate. Sift the flour over it in three additions, and mix with a spatula until smooth, but do not over-mix. Pour the batter into the baking pan and bake in a 350F oven until barely set in the center. Comments: This was the most straightforward recipe! No creaming butter and sugar, no cooking syrup to the “hair-of-an-angel” state, held at exactly 237.8 F while pouring over the spinning blades of a mixer. Still, I created another Armageddon in my kitchen. The recipe instructed to bake the cake for 30 minutes until barely set. I baked for 35 minutes and it seemed set. Unfortunately, I didn’t stick a tester in the center because I didn’t want to ruin the surface. Unfortunately, I trusted my “instincts” and removed it from the oven. You’ll notice that I omitted the baking time in the recipe: please use a toothpick to make sure the fondant is cooked. The recipe didn’t specify when or how to unmold it. I am aware that some cakes should cool in the pan, others should come out right away. I compromised and waited 10 minutes. It unmolded easily, but while flipping it over, the cake broke in two unequal pieces. One fell on the cake stand, the other on the countertop. Between them flowed a voluminous lava of chocolate batter, too much to qualify my production as a “molten chocolate cake“. Instead it became a “Cocoa Tsunami”, that took no prisoners. I admit to shedding a few tears. The saint I married assembled the pieces on a baking sheet, placed them back in the oven at a mellow 325 F for 30 minutes, and I regained my composure. Once both the cake and I had cooled off, I shaved chocolate all over to cover the abuse. 1. Never use your bare hands to stop a flow of hot cake batter. 2. 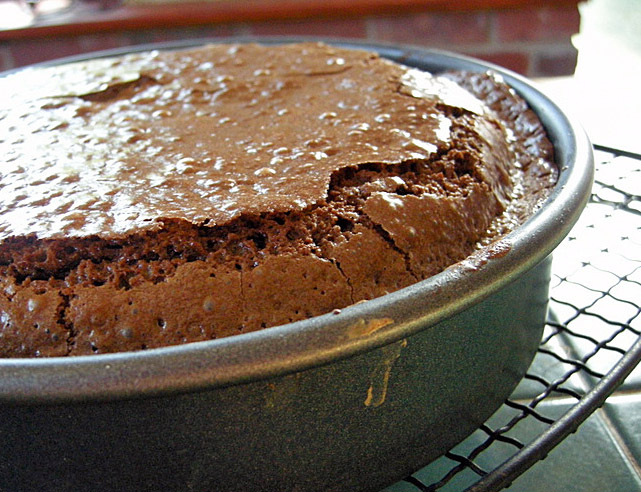 Chocolate fondant cake is so awesome that it’s worth the struggle. Unte uma fôrma redonda de 24cm de diametro. Coloque uma panela com uma pequena quantidade de água para ferver, diminua o fogo e sobre a panela coloque uma tigela refrataria. Bata os ovos e o açúcar apenas ate’ que cheguem a temperatura ambiente. Retire do fogo. Despeje a mistura de chocolate derretido sobre os ovos e acucar batidos, misture ate’ incorpoarar. Peneire a farinha em três adições, e misture com uma espátula até ficar homogeneo, evitando misturar demais. Despeje a massa na assadeira e asse em forno medio até que o centro esteja firme (teste com um palito, deve levar no minimo 40 minutos). Oh, Sally!! Had to smile at this post. =) And chocolate fondant cake sounds awesome! Oh..what kitchen images you present…Notes to self…check! You’ve put a smile on my face to start the day..hope you have a great one too! The cake looks great and delicious! The cake looks great even though it is supposed to have been broken. Well done, Sally and hubby team. Yes, it tasted pretty nice, even with all the trouble to get there. but I definitely want to make it again, cooking it right! I had this happen with my brownie recipe. I had doubled the butter by accident. This recipe looks just like mine doubled with only half the amount of flour. Cut back on the butter and increase the flour a tad and it will come out better. I’m blown away by how simple that is. Do I have the self control to not make this? Probably not. 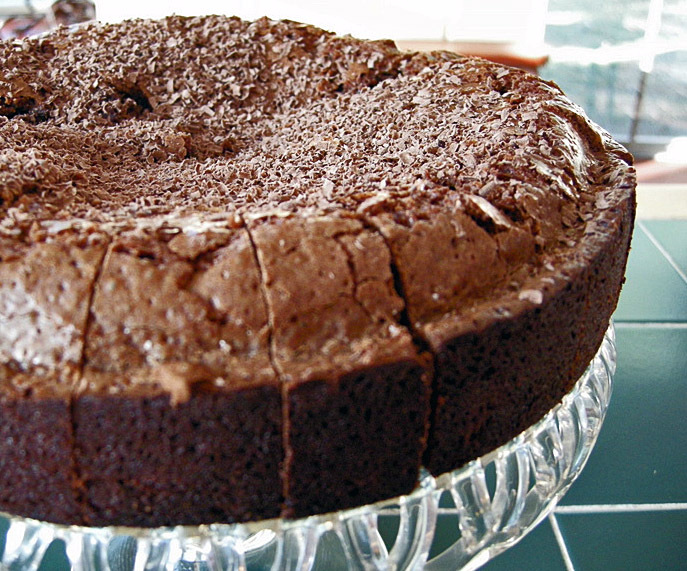 Simplest recipe with 5 ingredients for a heavenly cake. I love it!